Register Log In ECN Forum Forums NEC & other Code issues Do these water lines violate the NEC? Do these water lines violate the NEC? Not directly above panel- I say no. Working space extends to ceiling. That's not so easy to call. I would consider the "ceiling" to be the bottom flange of the I-joists. Even so, the copper lines attached directly to the flanges I would consider at worst a 'de minimus' (too small to matter) violation. The drain line is another matter. On balance, I'd let it slide as well. The plumber has little flexibility as to where the drain must run, and there is plenty of room to open the panel. I say this assuming that the vertical part of the drain does not also intrude on working space from the side! No violation of 110.26(F)(1) at least from the appearance in the elevation shown in the picture. The question does not ask if the drain line is in violation, only the water lines. We would need another elevation and some dimensions to determine if the drain line violated the working space. i think there is supposed to be up to a 1/4" inch space between the panel and the concrete wall. thats why we use kindorf or plywood. if true anyone know what nec section this would be. The raised mounting holes on the back of the panels are designed to allow air circulation and I don't know how successful they really are. Sometimes the installers use a power pin setter and they don't get the advantage of these .25" standoffs. 312.2 Damp, Wet, or Hazardous (Classified) Locations. (A) Damp and Wet Locations. In damp or wet locations, surface-type enclosures within the scope of this article shall be placed or equipped so as to prevent moisture or water from entering and accumulating within the cabinet or cutout box, and shall be mounted so there is at least 6 mm (¼ in.) airspace between the enclosure and the wall or other supporting surface. Enclosures installed in wet locations shall be weatherproof. Exception: Nonmetallic enclosures shall be permitted to be installed without the airspace on a concrete, masonry, tile, or similar surface. FPN: For protection against corrosion, see 300.6. Are you saying that this installation is in a damp, wet, or classified location...or is this just to clarify the 1/4" space required if it were in one of these locations? 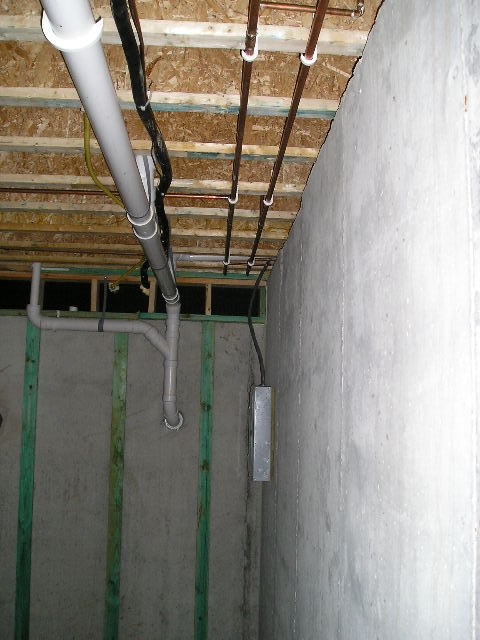 If the basement of a home is a damp or wet location then the Builder has a problem not the electrician.